Washington: Regular white rice; aromatic basmati; chewy, healthful brown rice; and even rustic wild rice are common pantry items. But there’s one rice variety that doesn’t get enough play: red rice. Red rice sports surprise a red husk and it has a nutty flavour and is highly nutritious. For rice and grain salad that was colourful, hearty and a little out of the ordinary, mix the healthful rice with nutty quinoa, cooking both in the same pot using the pasta method. Give the rice a 15-minute head start and then add the quinoa to the pot to ensure that both grains are done at the same time. Then drain them, drizzle them with lime juice to add bright flavour and let them cool. Next, look for ingredients that would make this salad fresh and a little sweet. Add dates and orange segments for sweetness (and use some of the orange juice in the dressing). Add a bit of fresh cilantro and red pepper flakes and a bit of spiciness to round it out. Bring 4 quarts water to boil in large pot over high heat. Add rice and 1 tablespoon salt and cook, stirring occasionally, for 15 minutes. Add quinoa to pot and continue to cook until grains are tender, 12 to 14 minutes. Drain rice-quinoa mixture, spread over a rimmed baking sheet, drizzle with 2 tablespoons lime juice and let cool completely about 15 minutes. Meanwhile, cut away peel and pith from oranges. Hold the fruit over a bowl and use a paring knife to slice between membranes to release segments. Cut segments in half crosswise. If needed, squeeze orange membranes to equal 2 tablespoons juice in a bowl. Whisk 2 tablespoons orange juice, remaining 1 tablespoon lime juice, shallot, minced cilantro, and pepper flakes together in large bowl. Whisking constantly, slowly drizzle in oil. 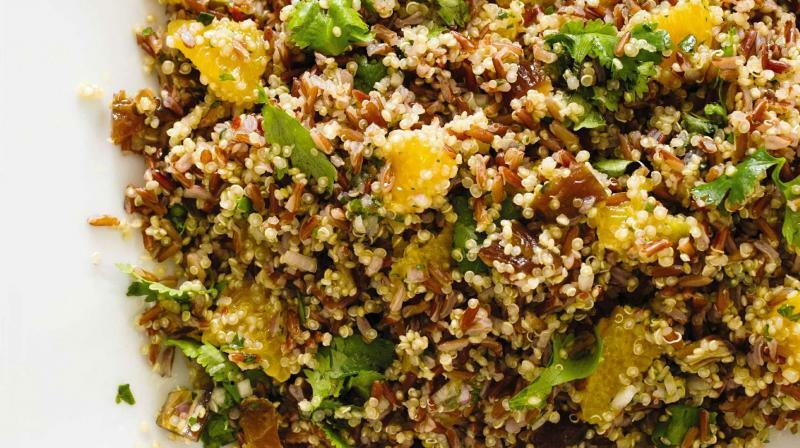 Add rice-quinoa mixture, dates, orange segments, and remaining 1 cup cilantro leaves, and toss to combine. Season it with salt and pepper to taste and serve.